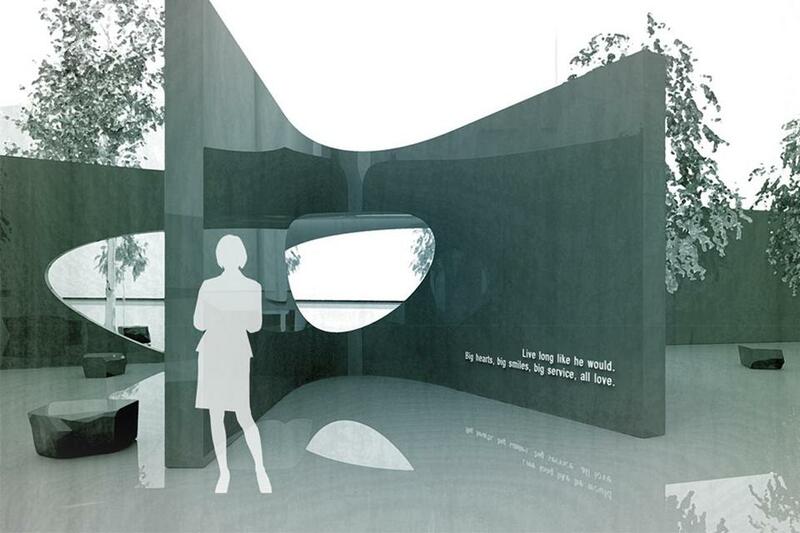 The proposed Sean Collier memorial on the MIT campus. The memorial design translates the ideals of “Collier Strong” into a structure that embodies both strength and connectedness. Inspired by the gesture of an Open Hand, the memorial consists of five radial walls which meet at a center. The central intersection of walls is then hollowed out to create a space of unity as oppose to separation—creating in its void a space for remembrance. Located at the gateway to North Court, the memorial structure and landscape transforms this site of tragedy into a site of reflection. An interconnected and intimate landscape of rocks and trees creates a space for contemplation shielded from the activities of Vassar Street and the campus. Constructed of solid granite blocks which act as buttresses-- the five walls converge to support a “keystone” which unifies the whole structure-- a timeless building method which exemplifies strength and unity. The open hand metaphor for the memorial resonates on multiple levels. It symbolizes generosity and service. It evokes “mind and hand”. It represents an extension of ourselves and principles-- we choose an open hand over a closed fist. The permanent Collier Memorial will offer our community the opportunity to remember the life of Sean and honor his service, and remind us of our values: openness in the face of threat, unity through diversity, and strength through community.